Garden Club Date Change for September! Cutie What???? We have been cranking out the "Cuties" at Quilter's Garden. "Cuties" are a pattern that requires a Cutie Pack. A Cutie Pack is 16 fat eighths, with a fat eighth being 9" X 22". We have several Cutie Packs to choose from. Each quilt also takes filler fabrics. We have at least 6 different quilts made in the store and Kay is busy making more! The "Cutie Packs" are just $25.99 and all of the patterns are $4. Finishing kits for the filler fabrics are available for most of them. We will be posting all of them on Facebook so check it out! Please note, Garden Club for September has been changed to Thursday, September 15 at 10 AM or 6 PM and Friday, September 16 at 10 AM. This is the first time we have ever had it on Thursday and Friday so make sure all of your peeps know too! Remember, no need to call ahead. Be sure to come with Show N' Tell! 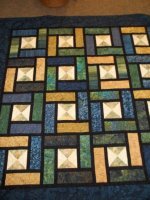 Plan ahead to attend the Mississippi Valley Quilt Show at the Mississippi Valley Fair Grounds, 2815 W Locust St., Davenport, IA on Friday, September 23 - 9 AM - 6 PM and Saturday, September 24 - 9 AM - 4 PM. 400 quilts are entered. WOW! Oh, and there will be some great vendors too!! !